I feel so #blessed to get to do what I love and all the amazing things that comes with it. Along with that, I get to help my fave brands showcase their new pieces. Whiskey Weekend, local Boss Babe Evan, reached out to me to help launch their limited edition long bomber. Now, if you follow along (which I'm sure you do, lol), you'll know I have teamed up with Whiskey Weekend in the past. Showing off some Local Love, collaborating with Rachel from Frankly Ray, in our 'Risk Taker, Heart Breaker, Gamer Changer' crew (which sold out out almost instantly). So ladies, be ready to get your hands on this bad boy! It's not a secret that bombers are in and make the perfect spring jacket, I'm totally loving the long bombers, making this Whiskey Weekend bomber the perfect rainy day or everyday jacket. Let's talk about the colour for a second, how great is this soft forest green shade?! Perfect, right? 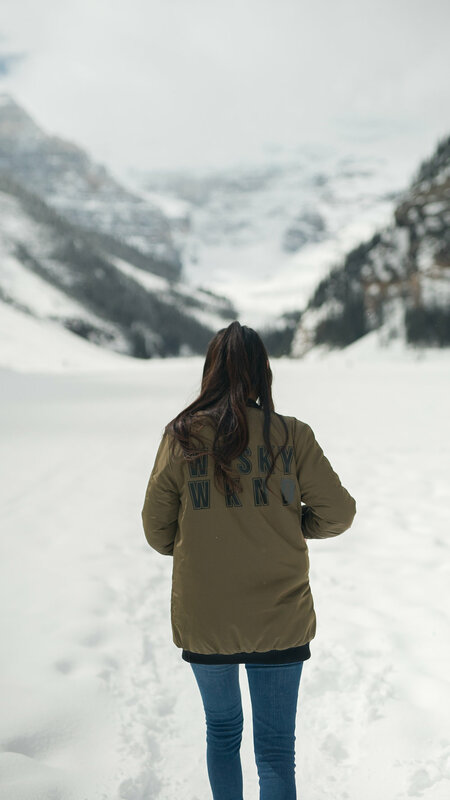 The team behind Whiskey Weekend, nailed the logo detailing on the back of the bomber. The other bits of great detailing of the jacket are the cuffs and collar. Everything ties in together, matching and really completing the look. The best part about the bomber, besides the orange lining, is how light weight it is, yet suuuper warm. The bomber is perfect for cool summer night, April showers, and makes a great layered piece. Truly a versatile garment. I paired the bomber with some high wasted jeans, a torn up blush sweater, and some sneakers. But as we all know, you can wear a bomber with just about everything, and Whiskey Weekend's long bomber is no exception.